Have you ever…. seen a rotary plow?? It’s been a few days since I had time to post. sorry! At least I can update you all on the state of our garden, explain how we are doing things, and where we’re at generally. 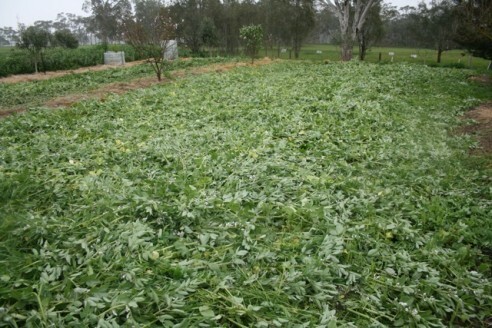 Check out this green manure crop! 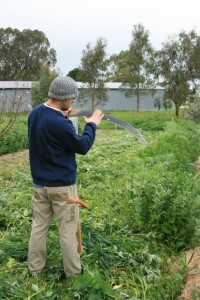 We dont have a mower or mulcher to cut down this crop, or a crop roller, so I had to break out the my BIG scythe blade to do the job. I dont often get a chance to use it, – if you look close, I’ve only nearly cracked a smile, but it might be a grimace, thinking of the work ahead. 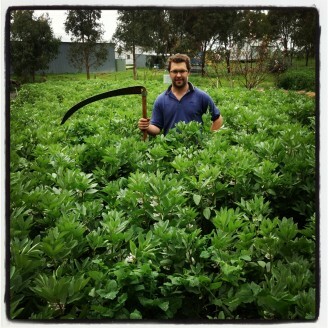 Beans make an obvious choice for a green manure crop. For starters, we know they make HUGE BIOMASS! and they are legume plants (not that it helps on a lot of organic soil, which already have too much organic nitrogen from manure inputs), the stems are fleshy and the leaves full of a gelatinous sap that sandy soils need and love as the plants break down. the Wheat we use because its cheap and the fibre in the leaves takes a little longer to break down. underneath these beans the stems are just starting to dry off, which will help recircle (yes, i did say recircle) Carbon back into this equation, which in turn will help the sappy, moisture rich beans decompose in optimum fashion. 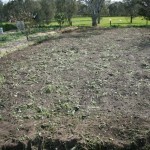 The thistles = silica and offer a hint that we worked our soil too wet last season. 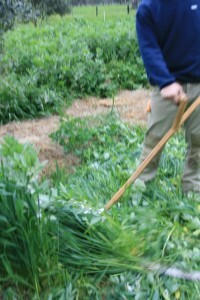 Normally I just use the scythe to harvest fresh compost material, and it’s a hard tool to beat for that job! but the beans are thick and top heavy, they fell like buttered toast! It was all down in twenty minutes! A rotary hoe would just clog up, offset disc wouldn’t penetrate that carpet, spade?? HA! Not likely. Even my reciprocating spader, which makes a meal of really tough situations would never deal with this lot. Anyhow, as far as green manures go, it would be enough to leave it as is at this point, utilising an in-situ mulch, there are enough roots under the surface to texture and aerate the soil (it’s nearly 60/40 above and below with wheat plants), but I’m greedy and want it all! that green stuff is full of sugar/protein/minerals/enzymes/biology/life! all good stuff! Bring on the ROTARY PLOW! 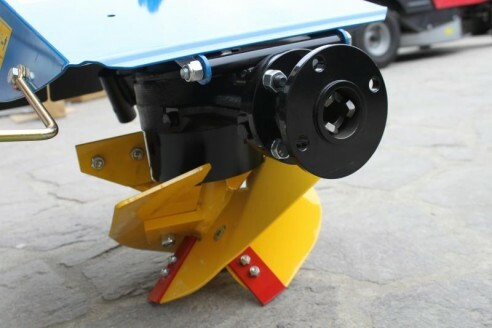 A rotary plow, a soil auger that moves through dirt horizontally. 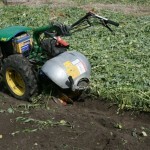 lifts and fractures dirt gently, buries everything!! I got a reversible version of this for my walking tractor, which means it has two augers, one for each direction, they flip over at the end of the row, otherwise you’d spend all day going in circles.. The really amazing thing about these is they leave no ‘hard-pan’ like a rotary hoe, use very minimal horsepower for a 10-12 inch deep cut, and if you hit a stump or stone, it just kinda skips around the obstacle. Very safe! I got stuck right in. Prior to starting the machine, I sprayed out some biology foods and humates to help the breakdown process along. Heres the proof in pictures. 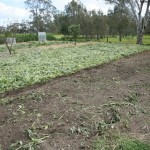 The Rotary plow made such short work of this bean crop, I drove it straight into another ‘bean-green-manure’ crop without cutting it down first, check this out! More leaf up on top, but amazing anyhow! 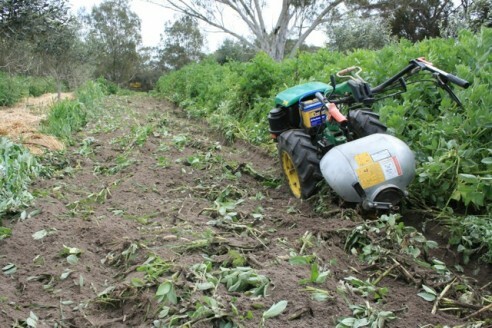 What other machine walks into a standing 1.2m high crop and buries it? I’d have to give a huge thumbs-up to these implements! It’s great to know that some of the tools available to smallfarm growers are actually top rate kit! For once there is a tool for the job that we don’t have to bodge together from old junk made for larger farms. And goodness knows, some days, smallfarmers need all the advantages we can muster! 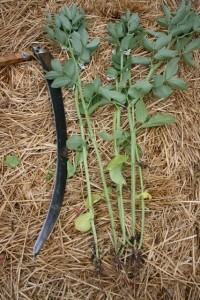 The beans disappeared within ten days, I ran my spader through the soil again after liming and compost, and we have perfectly friable worked and manured dirt. Well, as far as I can manage!! 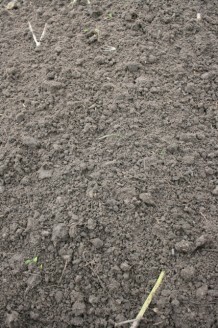 Today I planted corn and melons into the soil above, cant wait to see those come up! If anyone wants more info on the BERTA FRANCO ROTARY PLOW, then try Terry Evans at Vin Rowe Machinery, he’s got loads of experience in walking tractor outfits. Give him a call 0438 231362 Tell him I sent you! 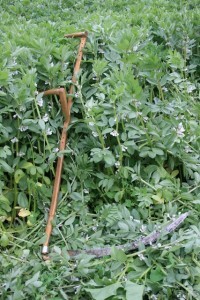 This entry was posted in In the Garden!, In the Toolshed!, Uncategorized and tagged beans, berta_franco, green_manure, organic techniques, rotary plow, scythe, smallfarm, soil health, walking_tractor by humble house. Bookmark the permalink. Very interesting, I wonder how one of those machines would work on a larger scale? I keep wondering how they might ‘gang-up’ too! or whether it would work with a much larger rotor?